We are always looking for more information regarding Reunions or Alumni organizations. The Troy High Alumni’s main Web Site is www.classcreator.com/troy-ny-1900. If you are planning, been invited to, or have heard about a reunion for a Troy High School Year, please email Erin Clary, Communications Specialist, at clarye@troycsd.org. Please help us make this page more informative and include more graduates of Troy High. Thank You! Please join the class of 2006 as we celebrate our 10-year Reunion at Franklin Terrace Ballroom in Troy. Tickets are $67. Click here for details. Please join the class of 1986 as we celebrate our 30th class reunion at Moscatiello’s Italian Restaurant on Friday,November 25, 6 – 10 p.m. Tickets must be purchased by November 17. Click here for details. THS Graduates are invited to the 25th Reunion on July 19th at 7 pm. O’Brien Public House (formerly Trojan Hotel), Downtown Troy. Great food and entertainment for $30.00. Email to Yankalar@hotmail.com for more information. All THS classes invited! The Class of 1964 celebrated it’s 50th Reunion in Troy during the weekend of September 19, 2014. With lunch at Illium Cafe, lots of festivities in downtown Troy, a dinner dance, brunch on the Captain JP, and a tour of THS. Please visit the Troy CSD Facebook page for photos of the THS tour and to see all of the great things happening at your alma mater! Class contacts: Mary Ann Giordano Ryan 283-5997 or Marilyn Petruska Niles 439-3404. Held their 41st and 40th reunion Saturday, August 10, 2013 at the Hilton Garden Inn, Troy NY. For more information email Theresa Crisp, Joyce Margolin or Henry Bisner if you are from the class of 1972; or email Sharon Bisner if you are from the class of 1973. Held their 25th Reunion on Friday, November 25, 2011. For more information email: troyhigh86reunion@gmail.com – we are also on facebook. Held their 25th Reunion on June 12, 2010. Contact person Melissa (Nichols) Shufon 518-588-7134 or email mms666@aol.com. Held their 50th Reunion on October 1-3, 2010. Held their 20th Reunion on August 7, 2010. 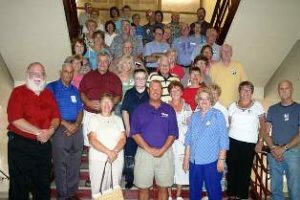 (Pictured here) THS Assistant Principal Pawlusiak with the THS Class of 1957 as they celebrated their 50th Reunion from September 7 to 9, 2007. A fun weekend was planned to include 9-hole golf tournament, welcome reception and cocktail party at Brown’s Brewing Co., a tour of Troy High School, and Saturday Evening Dinner Cruise on the Capt. JP II.